About 50 percent of kids in school have experienced some form of trauma. If a child’s stress-response system is activated by toxic stress or trauma, their brain is less able to engage in problem-solving, focused attention, and self-regulation of emotions and behavior. To foster trauma-informed environments that support learning, educators should create a sense of calm, safety, and predictability for their students. 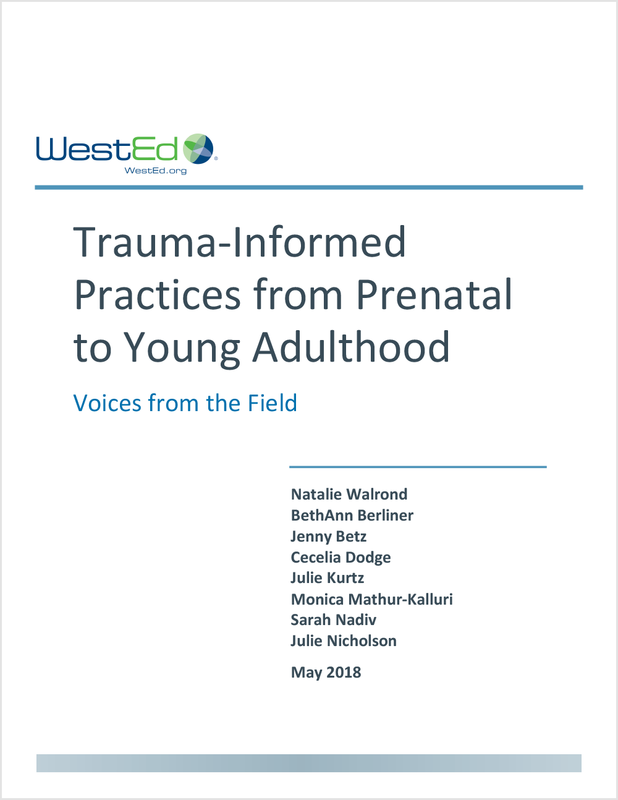 Do we have a sense of how many infants and children are impacted by trauma? Sarah Nadiv (Senior State Technical Assistance Specialist): About 50 percent of kids in school have experienced some form of trauma. When talking about trauma, we often refer to ACEs, which are adverse childhood experiences. The original CDC-Kaiser Permanente ACE study 3 looked back at the histories of people who were having chronic health problems as adults. This study was particularly powerful because it identified a strong relationship between the number of adverse experiences that people have in childhood and their later health outcomes. Children that experience more ACEs, for instance, are more likely to experience health-risk behaviors later, such as smoking, overeating, and promiscuity and thus be at risk for disease such as diabetes, heart failure, or cancer. Julie N: The original study listed seven ACEs, with three more added later. The original ACEs were physical abuse, sexual abuse, emotional abuse, household substance abuse, household mental illness, domestic abuse, and incarcerated household member. Three ACEs were added later: parental separation or divorce, physical neglect, and emotional neglect. Recent national data on the prevalence of these ACEs for children ages 1 to 17 show that, for the 10 ACEs, 45 percent of all children in the U.S. have experienced at least one ACE and 1 in 10 has experienced three or more ACEs. Children of different races and ethnicities do not experience ACEs equally. In every region, the prevalence of ACEs is lowest among Asian children and, in most regions, is highest among black children. The ACE study was revolutionary as it provided evidence about the significant prevalence of adverse experiences in the lives of children and youth across the U.S. It also brought attention to the need to invest in early interventions to prevent the long-term consequences of ACEs. How does trauma affect the brain and its development? Julie K: You can think of the brain in terms of three parts. The hindbrain is the part responsible for the “fight, flight, or freeze” response, which is the brain’s primitive, built-in survival reaction when danger is perceived. The limbic part of the brain is responsible for your emotions, attachments, and relational connections. And the prefrontal cortex is like the CEO of your brain, responsible for executive functioning skills such as self-regulation, problem-solving, perspective-taking, and focusing attention — it takes until your mid-twenties for the prefrontal cortex to be fully developed. Traumatic experiences lead children to feel significant levels of helplessness, powerlessness, and intense fear. Trauma and toxic stress prevent optimal development of the brain by changing the neural structure. When children are young, they have an immature brain. And when you’re a young child with a brain impacted by trauma, you have a higher chance of living in a chronically anxious state. Your brain gets rewired to release these chemical hormones that cause you to scan for danger all the time — so you perceive minor events as dangerous; you interpret things as scary when they’re not. You’re living in the hindbrain, which is that fight, flight, or freeze territory. When you live in that heightened, anxious state throughout the day, you can’t listen, you can’t learn, you can’t focus, you can’t pay attention. You can’t even build relationships. If we don’t heal the effects of trauma in early childhood, it can have a snowball effect throughout a lifetime. How does trauma affect learning? Julie N: If a child’s stress-response system is activated by toxic stress or a traumatic experience, it immediately cuts off the neural connections to the prefrontal cortex because it wants the body to react faster for survival. Children in that fight, flight, or freeze survival state are less able to engage in problem-solving, rational thought, focused attention, and self-regulation of their emotions or behavior, as well as less able to verbalize their experience — which are all essential to learning. Are the effects of trauma permanent, or can educators do things to help remedy the effects of trauma? Sarah: The thing that is most impactful in healing trauma, and mitigating the negative effects on the architecture of the brain, is having the buffering effect of a caregiver. Teachers have a profound ability to support children in their classroom that have experienced trauma. And a lot of trauma-informed practices, if not all of them, are perfect for supporting kids in the classroom and helping them learn even if they haven’t experienced trauma. Julie K: When kids are misbehaving, most adults use external punitive strategies — criticizing, punishing, threatening, blaming — to try to get kids to quickly behave. They’re not looking at it from a lens of teaching long-term strategies or healing a brain in pain from exposure to trauma. There’s something we call “the state of optimal regulation” that we want all kids to be in so they can learn — you don’t want them hyper aroused and you don’t want them hypo aroused. To achieve that optimal state, children need to feel safe with adults. When adults are calm and regulated, they, in turn, can regulate the internal world of the child. Whatever is going on related to the particular stress in your life, children, especially those who have experienced trauma, pick up on that stress and become more hyper or hypo aroused. So it’s very important as an adult educator to create a sense of calm and safety for children. To do that, it’s important to foster predictability and routine in the classroom, and limit unexpected changes. Julie N: I’d add that the way that a person’s emotional state is mirrored by the neuronal system of another person is an unconscious process. So, when you are hurt and I intuitively feel that pain, our neuronal systems are mirroring, but that happens at the subconscious level. Teachers have a profound ability to support children in their classroom that have experienced trauma. It’s important for teachers to be aware of the contagious nature of their mirror neuron system. When there’s a distressed child in your classroom, you can follow that child into dysregulation — if they’re yelling, you’d react to them by yelling. But if you do that, then the child feels more threatened and their behavior gets more dysregulated as you get more dysregulated alongside them. Or, you can remain calm and non-reactive, and you can use the mirror neuron system to guide the child back to an optimally regulated, calm state. And remember that it’s only in that calm state that children have access to everything in their prefrontal cortex, which is critical for learning. Should educators know the trauma histories of their students? Julie N: No, we don’t need to know the specific trauma histories of the children, and, in fact, we can’t — in most cases, we’re just not going to have access to that information. 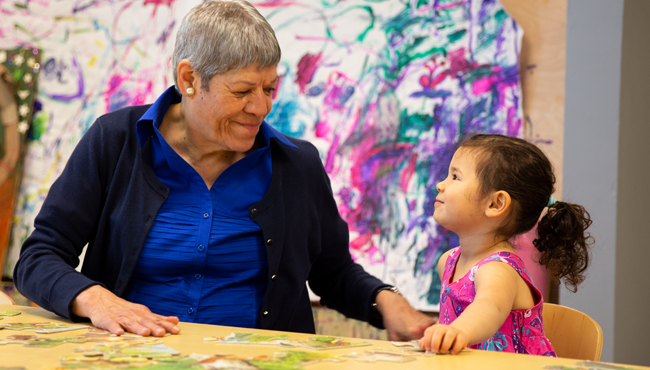 However, it is important for educators to understand the neurobiology of trauma, which we’ve been explaining, and its impact on children’s development, behavior, emotional state, and ability to learn. Until you understand that neurobiology, you’re not going to understand all the behaviors going on in your classroom and you’re not going to know how to de-escalate children and create a safe environment in which they can learn. It’s also important to be able to acknowledge the existence and prevalence of trauma in children’s lives. For a lot of reasons, people don’t like to talk about trauma in general, and especially trauma related to young children. Sometimes this silence comes from the difficulty of thinking about children in pain when we feel we can’t reduce that pain. Sometimes our silence stems from our own trauma histories. But part of being trauma-informed is being willing to break that silence and acknowledge every child and youth’s lived experience. Then, it’s also recognizing that we have a responsibility to learn trauma-sensitive strategies so that we don’t further traumatize children. There’s also the importance of engaging in systematic self-care because teaching is such hard work in general, and building an awareness of trauma and the ability to support students who have experienced trauma requires constant replenishment. It seems that self-care is particularly important for educators to enable themselves to be calm and balanced enough to carry out the sort of co-regulation practices you described earlier. Can you talk a little more about the idea of self-care? Sarah: It can be really challenging during the course of a work day to feel like you’re able to take care of yourself, but there’s a lot of different things that teachers can do, even if it’s just as simple as stopping and breathing. We talk a lot in our trainings about the power of pause — it can be very powerful to give yourself a moment to stop and take a deep breath before proceeding. Then there’s also all the other good stuff we know that people can do to take care of themselves — connecting with colleagues and friends, and talking about what’s going on that day or that week. I work with some teachers who text each other an inspirational quote at lunch time, and that can help them in moving through the rest of the day. We also talk about self-care in terms of identifying your values and setting goals for yourself, and that can be really important for educators to remind them of what they want for themselves and why they became educators in the first place. How can administrators support the implementation of trauma-informed practices in their schools and districts? Julie N: In order to move their schools or districts toward becoming trauma-informed environments, administrators would first want to make sure that people understand the neurobiology of trauma, which would likely require some training, and that policies and practices take that into account. So, for instance, if you’re an administrator in a school with a zero-tolerance policy, you’d want to assess the impact of that sort of punitive approach. And you’d need to examine policies that remove a child from the classroom — in many cases, that child would likely benefit from the buffering, calming effect of an adult, so separating them out wouldn’t be a trauma-informed policy. So, administrators could take a neurobiological lens and use it to inform their policies. All of this trauma-informed work is completely connected to supporting children’s abilities to learn. In addition, if you’re going to acknowledge trauma and move away from that culture of silence, you also have to have a common language to talk about trauma in a way that doesn’t stigmatize children and entire communities. Instead, the focus should be on creating environments that support healing and build resilience. Can you tell us what it looks like for a school, district, or early learning site to be a “healing organization”? Julie N: The term “healing organization” was coined by a Bay Area program called Trauma Transformed. A healing organization fosters an integrated environment where people aren’t siloed in their work. It’s collaborative and promotes authenticity. There are intentional spaces for staff to pause — you can’t gain awareness and be able to interrupt your reactivity without taking time to pause and reflect. A healing environment would also enable teachers and staff to make meaning of difficult experiences. So, for instance, that might be through reflective supervision, where you’re dialoguing and processing something in the classroom that was difficult, or through a community of practice. And there’s a place for a sense of joy. That may sound silly, but I’ve been in so many places where just to laugh and actually experience feelings of joy is an outlier, because it’s a place where people are just surviving. What would you say to administrators who might be hesitant to invest the time and funds to develop a trauma-informed, healing environment — because their budget is tight or because they may think there aren’t enough quantifiable outcomes to justify this sort of work? Sarah: First, I would tell them that there actually are quantifiable outcomes. In all of the coaching work that we do in schools, we collect data and look at various outcomes. Some of the metrics that administrators may be interested in are job stress and teacher satisfaction: if you have teachers that are less stressed and they like their jobs, then there’s going to be less job turnover, which can save money and time. Also, trauma-informed practices can greatly improve the classroom environment, which has a positive impact on children, teachers, and schools. 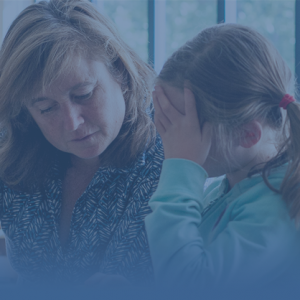 Trauma-informed practices can also improve individual children’s behavior, which, in turn, impacts the child’s learning outcomes and the overall classroom environment — and lowering teacher stress and increasing job satisfaction are also tied into that. Another benefit we see through the research is related to the long-term impact of trauma-informed practices. When you have teachers of preschoolers who are using the kinds of strategies we’ve been discussing, we see their students get to kindergarten with improved kindergarten-readiness assessment scores. Julie N: When you can stop the pattern of adults being dysregulated and triggering that fight, flight, freeze behavior in children, that can have a big impact — it can lead to fewer kids being sent to the principal’s office, and fewer suspensions and expulsions. And when you can disrupt that pattern of exclusionary punishment and actually keep children in classrooms learning, that’s an important outcome that speaks directly to principals and superintendents that care about learning. Another important consideration if you want children to be able to learn the material and do well on the test is that you need their stress-response systems to be calm and regulated so they won’t be in that mode of scanning the environment for danger. When they’re doing that, they’re not able to attend, listen, or take in any of the needed information. So, all of this trauma-informed work is actually completely connected to supporting children’s abilities to learn. And when they can better understand what’s beneath the child’s behavior, they can begin to create a path to remove barriers so children can learn. And, in turn, the educators feel more efficacy in that context. 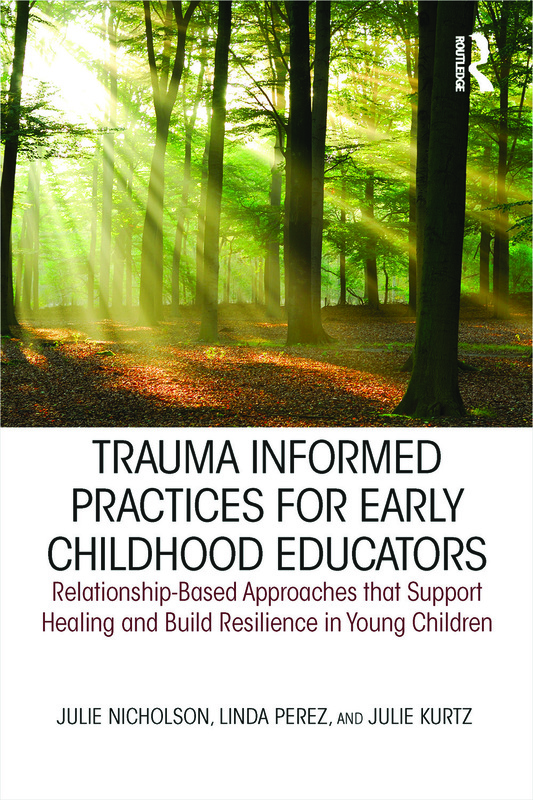 2 Trauma Informed Practices for Early Childhood Educators: Relationship-Based Approaches that Support Healing and Build Resilience in Young Children, authored by Julie Nicholson, Julie Kurtz, Linda Perez, and published by Routledge, comes out in October 2018. 3 Felitti, V. J., et al. (1998). Relationship of childhood abuse and household dysfunction to many of the leading causes of death in adults. The Adverse Childhood Experiences (ACE) study. American Journal of Preventive Medicine, 14(4), 245–258.